The Mellon Mays Undergraduate Fellowship (MMUF) program is a long-term effort to help remedy the problem of underrepresentation in the faculty ranks of higher education. MMUF aims to create a legacy of engaged scholars who will provide opportunities for all students to experience and learn from the perspectives of diverse faculty members. 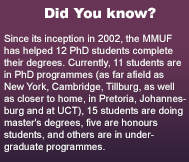 Established in 1988, MMUF works to achieve its mission by identifying and supporting students of great promise and helping them to become scholars of the highest distinction. The name of the program honors Dr. Benjamin E. Mays, the noted African American educator, statesman, minister, and former president of Morehouse College. The program is designed to encourage fellows to enter PhD programs that prepare students for professorial careers.